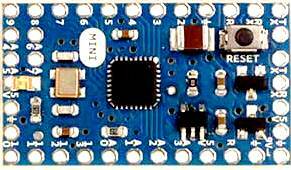 The Arduino Mini is a small microcontroller board originally based on the ATmega168, but now supplied with the 328. (datasheet), intended for use on breadboards and when space is at a premium. It has 14 digital input/output pins (of which 6 can be used as PWM outputs), 8 analog inputs, and a 16 MHz crystal oscillator. It can be programmed with the USB Serial adapter or other USB or RS232 to TTL serial adapter. The new Mini (revision 05) has a new package for the ATmega328, which enables all components to be on the top of the board. It also has an onboard reset button. The new version has the same pin configuration as revision 04. NOTE: Don't power the Arduino mini with more than 9 volts, or plug the power in backwards: you'll probably burn it. 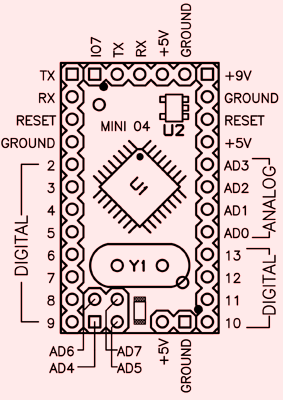 The Arduino Mini can be programmed with the Arduino software (download). To program the Arduino Mini, you will need a USB Serial adapter or other USB or RS232 to TTL serial adapter. 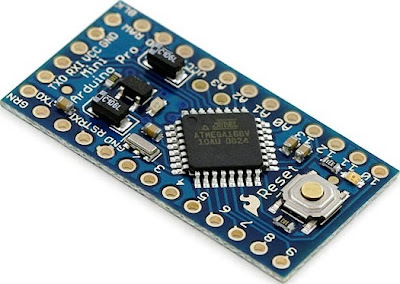 The ATmega328 on the Arduino Mini comes preburned with a bootloader that allows you to upload new code to it without the use of an in-system-programmer. The bootloader communicates using the original STK500 protocol (reference, C header files). You can also bypass the bootloader and program the ATmega328 with ICSP (In-Circuit Serial Programming); see the page on bootloading the Mini for information on wiring up an ICSP header to the Mini and the programmer for instructions on using a programmer to upload a sketch. Each of the 14 digital pins on the Mini can be used as an input or output. They operate at 5 volts. Each pin can provide or receive a maximum of 40 mA and has an internal pull-up resistor (disconnected by default) of 20-50 kOhms. Pins 3, 5, 6, 9, 10, and 11 can provide PWM output; for details see the analogWrite() function. If anything besides the Mini USB (or other) adapter is connected to pins 0 and 1, it will interfere with the USB communication, preventing new code from being uploaded or other communication with the computer. The Mini has 8 analog inputs, each of which provide 10 bits of resolution (i.e. 1024 different values). Inputs 0 to 3 are broken out onto pins; input 4 to 7 require soldering into the provided holes. By default the analog inputs measure from ground to 5 volts, though is it possible to change the upper end of their range using the AREF pin and some low-level code.